Problems with door locks can be a nightmare. But, recognising the issues with a lock is the key to success. Sorry for the terrible pun. When it comes to fixing your home locks, you need pot ensure that you are aware of what the problem is. That way, you can fix the problem yourself. 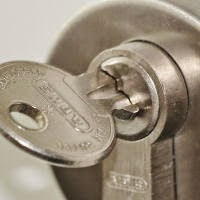 While this can be something of a complex task, it’s not uncommon for people to fix problems with keys and locks in the good old fashioned DIY manner. It’s all about having the right techniques. This is one of the most common types of problems with conventional door locks. The key refuses to work or budge when it is in the lock. Make sure that the deadbolt hasn’t dropped. If this is the case, lift the door as you unlock it. But, do be sure to lubricate and clean the lock. Simple lubricants and oils can make sure that there is a smoother flow within the mechanism of the lock and key. A slow locking door could be a sign of a more significant problem. This is a common sign of wear and tear. So, if you have found that your lock is not working in a way that it should be, it may be time to clean the lock mechanism. Disassembling the lock can be a good way of ensuring that the mechanism if free of grime and dust. Using a lock de-icer can blast away scum from the mechanism without the need for taking it apart too. When a lock is broken or loose, this can result in 360 degree turns. When this is the case, you need to ensure that you are tightening the set screws. Just remove the faceplate and tighten accordingly using a screw driver. You will hear a clicking sound when they have engaged with the slot. The faceplate can then be replaced. The latch can be a complex mechanism within the lock. In some circumstances, this may be best left to a locksmith. A locksmith in Columbus Ohio can help with this issue. Ensure that the hinge screws are fastened correctly. But, also ensure that the latch is properly aligned with the door. If it has dropped, it may be time to replace the entire lock. Sometimes, the lock can be screwed in too tightly. If this happens, make sure that you are loosening the screws. This can remedy the problem with ease. A key stuck in a lock can be a pain. But, you need to release the broken key with ease to ensure that you don’t cause further damage. Using a pair of pliers, gently remove the lock. In some cases, it may be best to remove the cylinder barrel entirely. Of course, this should only be used as a last resort. Key and lock problems can easily be fixed with some general know-how! You don’t have to spend a fortune on repairs. About To Start A Project? Read The Official DIY Rule Book First!